Of course my life gets stupidly busy just when the local snowdrop season starts, but how can I complain when each day brings new blooms? 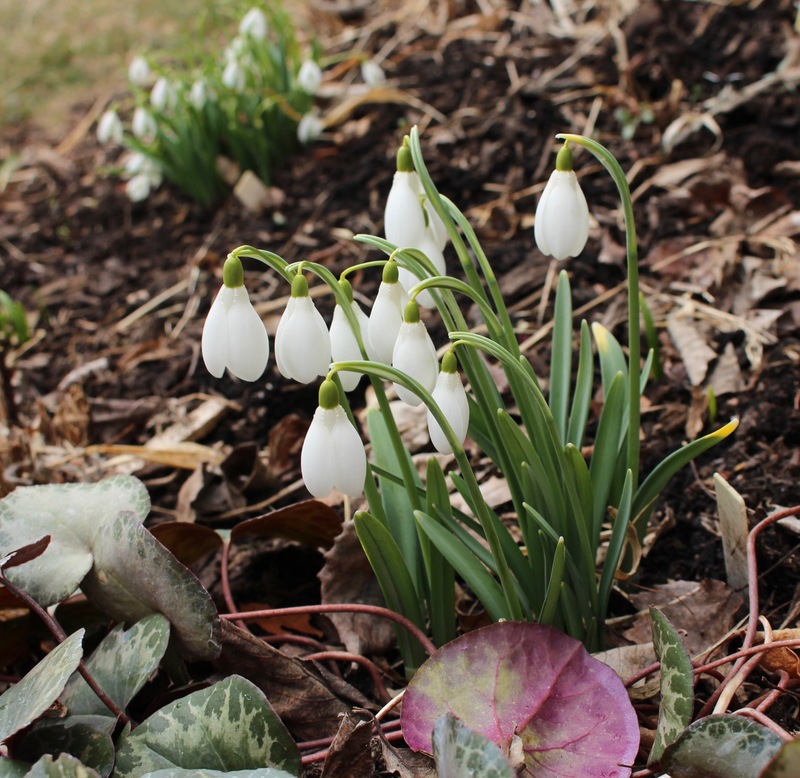 Thursday and Friday were warm and that’s just what these snowdrops were waiting for. Galanthus ‘Blonde Inge’ on her first day out in the sun. She’s still a little pale but her yellow inners just glow in the afternoon light. For those who yawn at the sight of more mostly white, always tiny flowers I apologize. I’m in a rush, but I’ll still take the time to be that guy at the party who goes on way too much about something he’s already told you a million times before. I can’t help myself and even the half hearted ‘uh-huhs’ and sideways glances won’t be enough. Such is the curse of the galanthaholic. Galanthus ‘Rosemary Burnham’ starts out tiny, but gets a little bigger as each warmish day passes. For some reason I don’t think she’s as green as usual this spring but still a beauty. For the next few days the weather looks perfect for bringing on the main season of snowdrops. 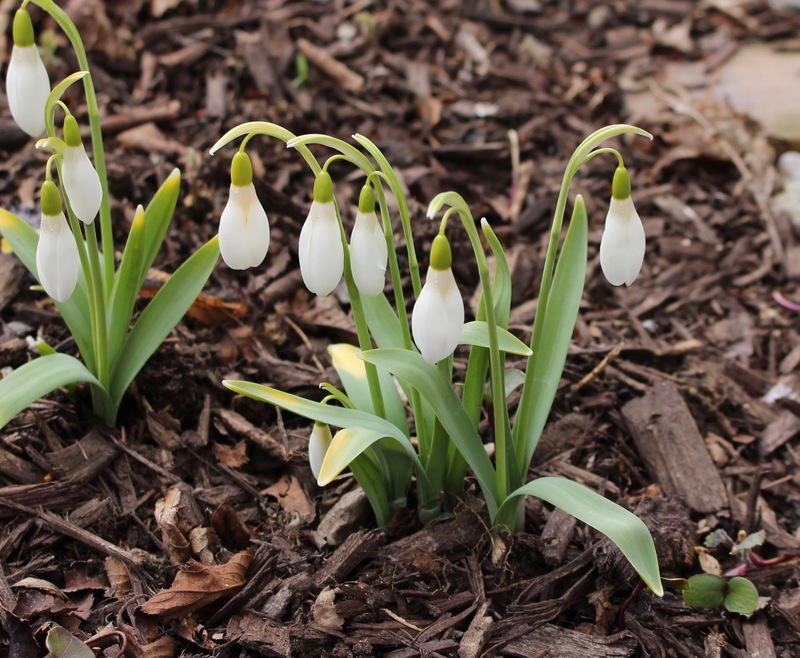 Here in my part of America, snowdrop season is often a real up and down thing, with none of the gentle transitions which mark more moderate climes. Some types take it all in stride, such as this Galanthus gracilis which a friend brought back for me after a spring visit to Nancy Goodwin’s Montrose Gardens. It comes up early and for the most part shrugs off even the worst ice and cold. 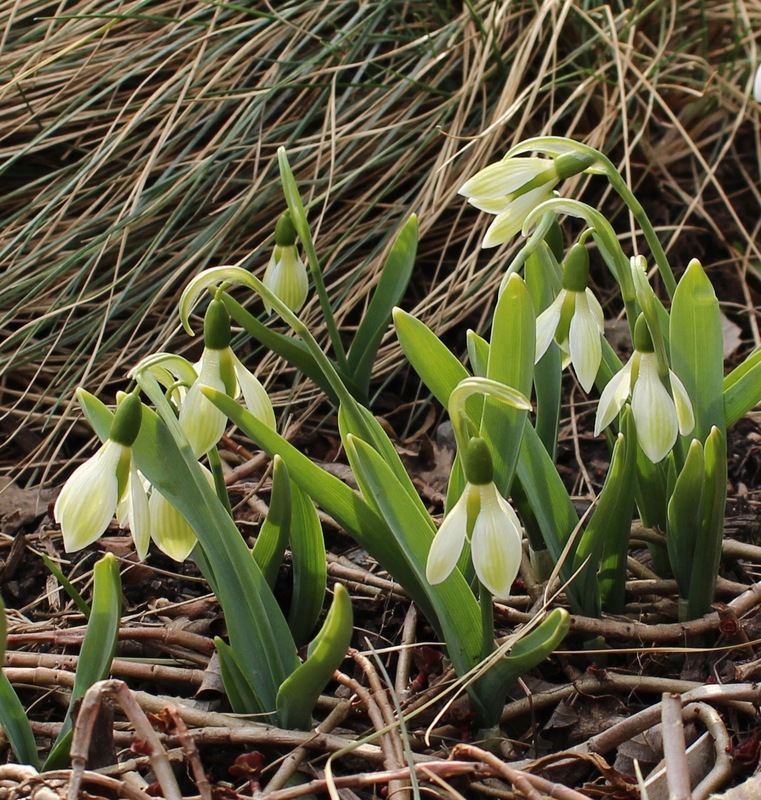 Galanthus gracilis with its trademark twisted foliage. It’s growing like a weed here in this dry, sunny spot alongside the front walk, but the exposed spot does seem to yellow the flowers a bit. Not everyone takes the weather in stride. Just a week ago temperatures dropped down into the single digits, snow and ice were all over again, and some of the more exposed drops took a hit. I’ll spare you those pictures but here’s one that’s not too bad, of ‘Gerard Parker’ growing in the front border. ‘Gerard Parker’ with a few singed blooms and burnt tips. Still nice enough, but notice ‘Primrose Warburg’ coming up in back with perfect flowers. Primrose is just a little later and missed the worst of the weather, and Gerald might have to go back to a more sheltered position. As I work out which drops get to fill in the front street border the yellow winter aconite (Eranthis hyemalis) are working hard to fill in on their own. It may take more time than I have, but someday I hope to have sheets of yellow and white filling this part of the yard. 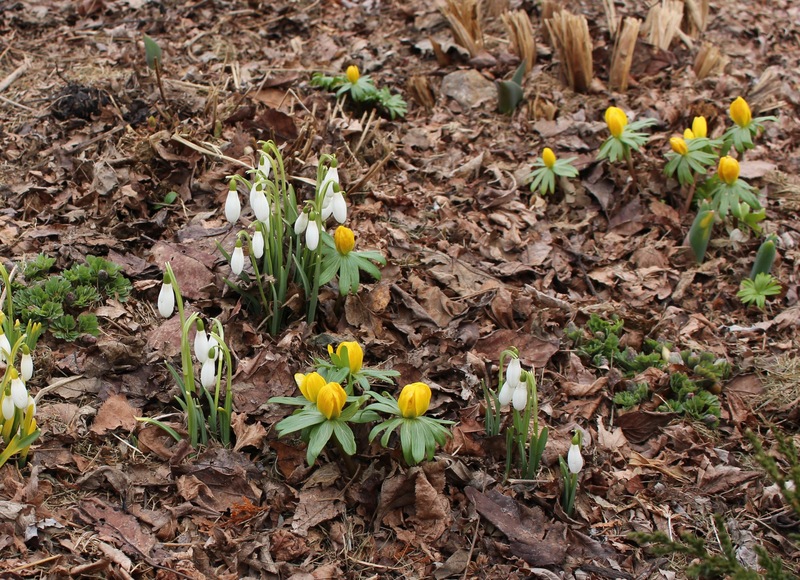 Year by year the snowdrops (G. nivalis) and winter aconite fill in. Hopefully I didn’t put too much mulch down for this year’s crop of seedlings to come up through. ‘Nothing Special’ might be a good choice for the front border. It’s a strong growing beauty which seeds out a bit as well and I’m sure as a taller snowdrop it might compete better with the winter aconite than the little Galanthus nivalis which are there now. So much for quickly, eh? 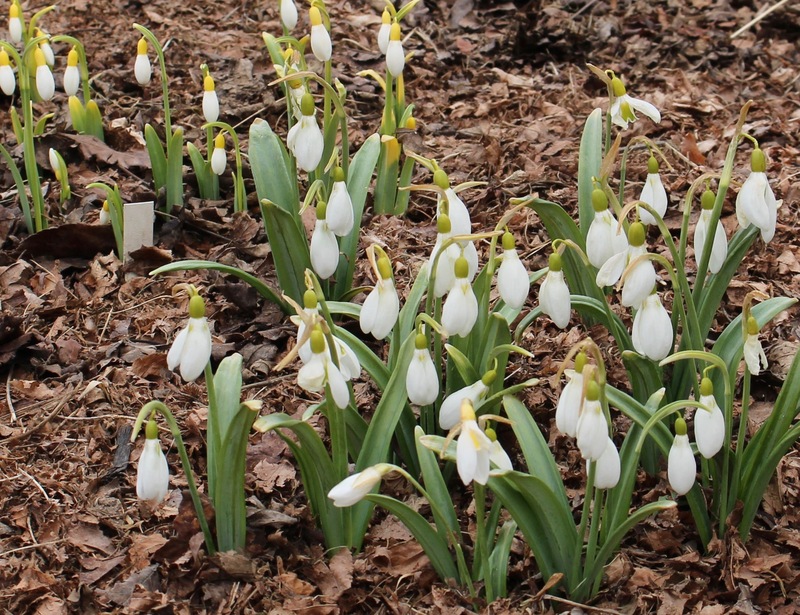 Speaking of snowdrops and how some are not good competitors here’s ‘Norfolk Blonde’, a tiny pale thing which might be my favorite thing this minute. I’m just so pleased that it came back a second year and didn’t fade away into the growing heap of snowdrops I regret losing. The petite ‘Norfolk Blonde’. I had to prune a few leaves off the cyclamen to keep it from overwhelming my little darling. You’d judge me if I said how much I paid for this one, especially considering she’s easily doubled in size from last year! I’ll leave off on an amazingly vigorous drop which a friend gave me two years ago. It’s considered a cross between two species (elwesii x nivalis) and in its second year it’s already forming little clumps. I love the foliage and it’s a heavy bloomer as well. Another contender for drift status, this Galanthus elwesii x nivalis hybrid will hopefully continue to multiply and flower strongly over the next few years. As you know I could go on and on, but it’s bed time and I’ve got a snowdrop adventure planned for tomorrow morning. Fair warning that there will be more pictures and way more snowdrop talk, so feel free to tune me out until April if need be. 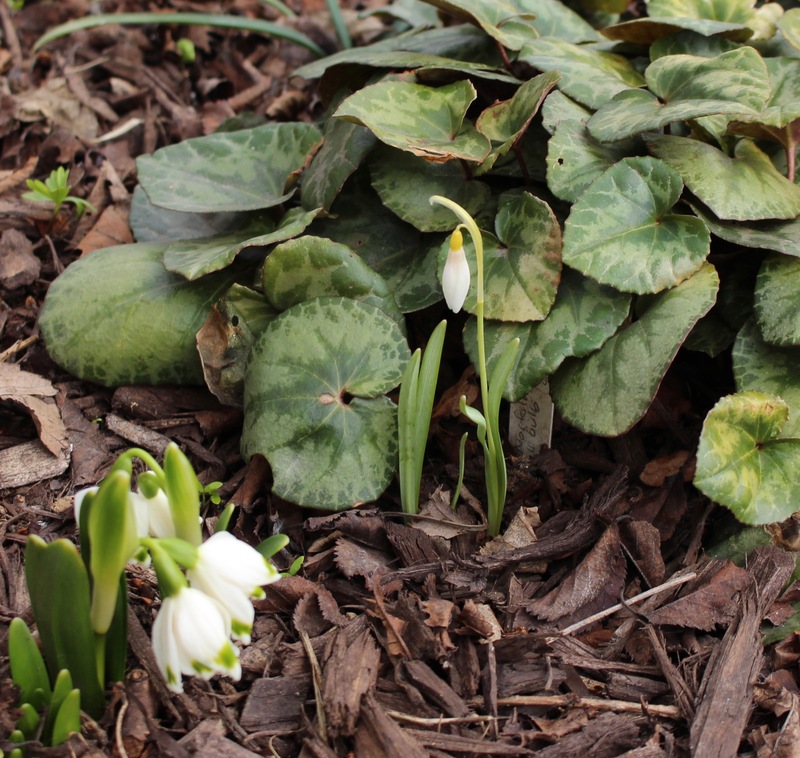 This entry was posted in late winter, snowdrops, spring bulbs, Uncategorized, winter flowers and tagged American Snowdrops, bulbs, galanthus, pennsylvania garden, spring. How wonderful that you are having your snowdrop season now, mine are just a happy memory and I will have to wait another 9 months to see any! You have a wonderful selection, you have really got the bug haven’t you! Have a wonderful time with your snowdrops! I guess I finally admitted to myself that I have the bug, so no denying that! Yes, your garden looks so wonderfully colorful and green already while mine is still windswept and bleak. Even with the snowdrops! Maybe tomorrow things will warm up and calm down. I think it’s about time! Loved seeing your gorgeous snowdrops, I wish you would go on and on. More please! I love Rosemary Burnham, she’s on next year’s list. ‘Rosemary Burnham’ is a wonderful drop. She is on the small side, but so nice and early I’m always pleased to see her! Just enjoy, and share your passion as much as you like. I don’t share it, but I still like to hear it. Have fun on your snowdrop adventure! Have you thought of joining Snowdroppers Anonymous, Frank? Seriously, though, they are lovely, and I am envious of your ability to grow them. However, I have to admit that I’m fonder yet of the winter aconite. Something about that stunning yellow on the first sunny, warm-ish days of late winter just really cheers me up! 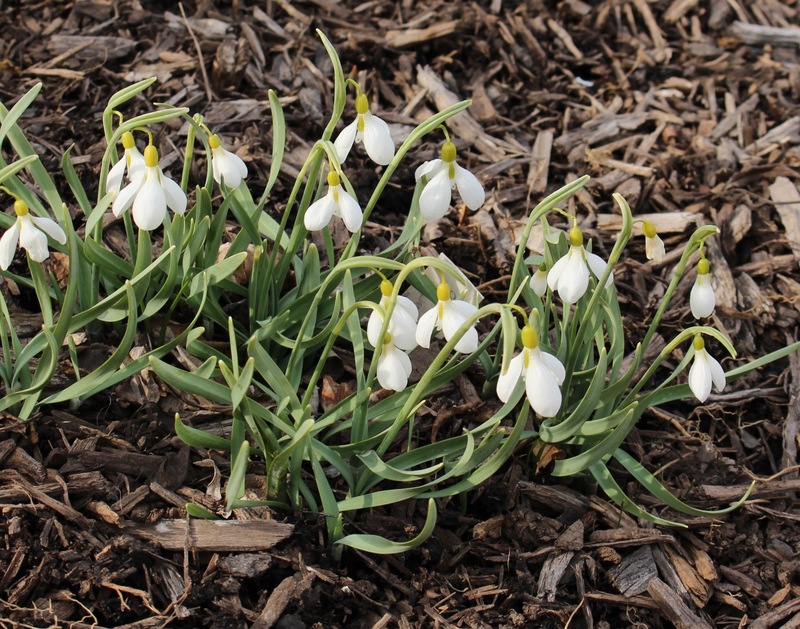 I most definitely do need to get me some snowdrops next year — yours are an inspiration! Maybe by then my de(con)struction mess will be over with? I was amazed though that ONE tiny group of winter aconite managed to survive all the excavation, grading, stomping, and what-have-you and pop up last week. They too are on my Must Have Again list. I’m glad to hear things are surviving in that construction zone of a house! Hopefully you can get to planting again real soon. 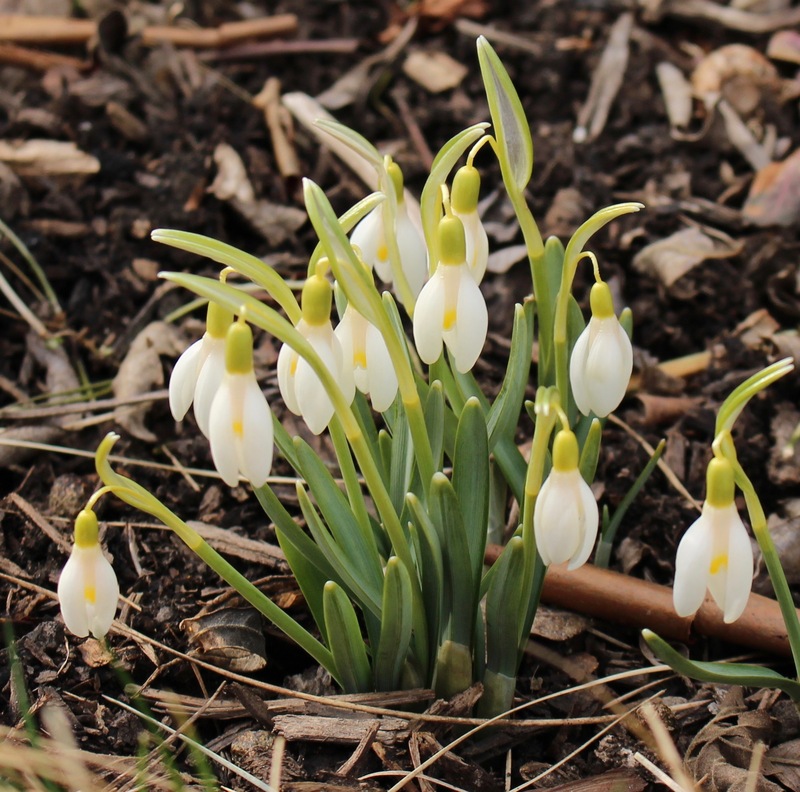 I enjoy seeing your snowdrops, even though I am no galanthophile. It is good to hear about other gardeners’ passions! Oh, I am lovin’ it! Can never have too many snowdrop pix for me. There will be just a few more from me 😉 but hopefully soon yours will have a chance to thaw out! If only our jobs didn’t get in the way of our gardening. My job is generally super busy in May, which can be very annoying. Love your Snowdrops and Winter Aconite. I don’t have your variety of Snowdrops, I like ‘Nothing Special’. I would never tire of seeing your snowdrops over and over again. Each spring. They give me hope that my few will eventually become larger clumps and return each late winter early spring.